A landlord who went into a flat to investigate the source of a major leak was battered by his tenant. Benjamin Bentley’s landlord found the flat contained a toilet full of human waste which appeared not to have been flushed and water all over the bathroom. But Bentley became annoyed when the landlord said he would have to leave and pushed him against a wall before headbutting him. Bentley, 24, formerly of Charnley Road, Blackpool, now living in Mayfield Avenue, Hull, was found guilty of assault after a trial in his absence. 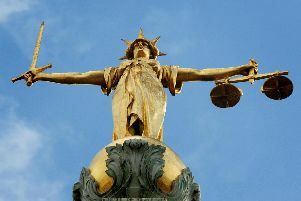 He admitted breaching a community order made for offences of assault and shoplifting by not keeping in touch with the probation service and failing to answer bail. He was sentenced to a 12 months community order with up to 15 days rehabilitation to be supervised by the probation service, put on a 28 days curfew from 8pm to 7am and ordered to pay £100 compensation to his victim by Blackpool magistrates. Prosecutor, Martine Connah, said a landlord was told there was a major leak at his block of flats on Charnley Road on January 16. In an attempt to find the source of the leak he went into Bentley’s flat and found the toilet full of waste. The landlord told Bentley he would have to leave but the defendant told him he would have to leave the flat. He then pushed and headbutted the landlord. Leisa Splaine, defending, said her client had had no intention of assaulting the landlord. Bentley had not been happy about some aspects of his accommodation and he said the landlord just walked into his flat. Ms Splaine added that Bentley, who had mental health issues and had said he sometimes hears voices in his head, was someone who needed support. A father-of-three young children vowed to a court he had given up his cannabis habit and said he would never let his children breathe in cannabis smoke. Antony Atkins had been caught growing five cannabis plants upstairs at his home by police who went to the address. Atkins, 28, of Hawthorn Road, North Shore, admitted cultivating and possessing cannabis plus fraud. He was sentenced to 21 days jail, given a 12 months conditional discharge and ordered to pay £240 compensation. Prosecutor, Martine Connah, said police went to Atkins home after he sold an X-box and games which did not belong to him at a second-hand shop. At his address officers found five cannabis plants growing in pots upstairs and some cannabis in wraps in two jars on March 18. Howard Green, defending, said the items Atkins had sold in his name at the second-hand shop had been taken in a burglary. He had been asked to sell them by a man who then gave him £30. Atkins accepted he had had a problem with cannabis. He had been told it was cheaper to grow your own cannabis. He had grown the five plants from seed, but they were small and months from being harvested. Since the offences he had stopped smoking cannabis and was getting help from rehabilitation experts. A man who threatened to snap police officers had to be pepper-sprayed after he lost control of his temper. Jamie McKinlay, 36, of General Street, Blackpool, pleaded guilty to behaving in a threatening behaviour. He was given a 12 months conditional discharge and ordered to pay £20 victims’ surcharge. Prosecutor, Martine Connah, said police received a report a man had collapsed in an alley near Charnley Road on June 9 at 1pm. When an officer got there McKinlay had been seen by paramedics and returned to his flat on Albert Road. His behaviour then became so bad he had to be pepper-sprayed. A man who agreed to leave an address when asked to by police was later seen putting a ladder up against the side of the property in the early hours. Martin Logan, 38, of Draycot Avenue, Grange Park, pleaded guilty to breach of the peace and was bound over in the sum of £100 for 12 months. Prosecutor, Martine Connah, said police got a report of a domestic incident involving a woman at Logan’s home on July 20. Logan agreed to leave the address but about 4.30am police were asked to return there as he had put a ladder against the side of the property. Police found him hiding in the back garden. When officers tried to arrest him he resisted and had to be pepper-sprayed. Stuart Newman, 25, breach of bail, criminal damage and assaulting a police officer. A 25-year-old man has been refused bail.Stuart Newman, formerly of Shaftesbury Avenue, Blackpool is charged with a breach of bail, criminal damage and assaulting a police officer. He will next appear at court via a video link from prison. Kelly Howarth, 31, driving with excess alcohol. A single mother seen driving without lights and swerving across the road was found to be almost twice over the alcohol limit. Kelly Howarth, 31, of Preston New Road, pleaded guilty to driving with excess alcohol. She was banned from the road for 17 months and fined £280 with £85 costs plus £30 victims’ surcharge. Prosecutor, Martine Connah, said police saw Howarth driving a Suzuki Vitara without lights on Preston New Road on June 25 at 12.40am . The officer then saw her swerve across the road and nearly hit another car, before doing a U-turn and stopping in Mayfair Road. A breath test showed 66 micrograms of alcohol in her body - 35 is the limit.